Poing, Germany - IFEN GmbH, the leading manufacturer of GNSS navigation test and development products and services, today announced the launch of its new NCS TITAN GNSS Simulator. The unique flexibility and outstanding performance of the NCS TITAN GNSS Simulator is beyond the capabilities of any other simulator currently on the market. With up to 256 channels (and 1024 multipath channels) and up to 4 RF outputs per chassis, the extra complexity and cost of using multiple signal generators is avoided, improving reliability without compromising on functionality. The innovative design of the NCS TITAN allows users configure channels for any GNSS signals and allocate those channels to any of the RF outputs fitted. This flexibility enables the same Simulator hardware to be used for an extensive range of tests, for all types of GNSS applications. The NCS TITAN sets new standards in the field of GNSS Simulation, in terms of fidelity, accuracy, dynamics, iteration rates and reliability. "The launch of our brand new NCS TITAN GNSS Simulator represents another milestone for our NCS GNSS simulator products", explains Dr. Günter Heinrichs, Head of Customer Applications. "This shows clearly once again our commitment to ongoing product enhancement and dedication to providing our customers with best GNSS test equipment on the Market". 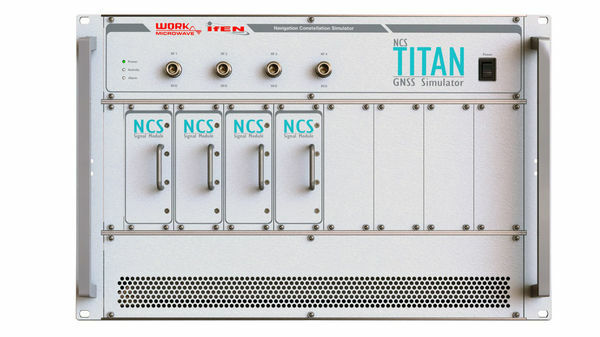 The NCS TITAN GNSS Simulator has been developed in cooperation with WORK Microwave GmbH, Germany.